The holidays and the rest of the winter weather is on it’s way and along with it is a couple of hefty heating bills. Let’s not beat around the bush, those higher heating bills that follow-up right after those holiday spending sprees and it really can take a dent out of your bank account. As your local Essex HVAC specialist, we feel your pain which is why we’re here to help however we can. 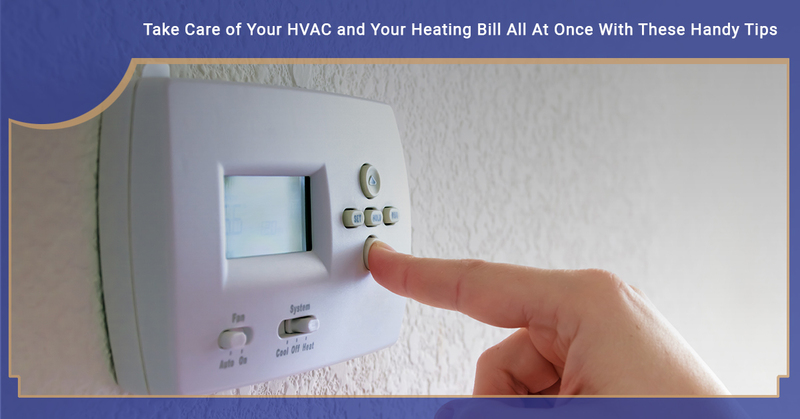 Which is why we’ve collected the best tips to help you slash your heating bill while keeping your HVAC in great shape. While a balmy 70 or 72 feel much better in the winter than a lower temperature, just think of how nice it’ll be when your heating bill isn’t triple digits? Besides, we’re not suggesting your drop the thermostat to like 40 degrees or something similar. We’re merely implying it might be time to look at 67 or 68 during the day and 55 during the night hours when you’re asleep, and just before you get up. This will actually help you sleep deeper, as colder temperatures help you fall into REM cycles easier too. In regard to your heating bill, every degree you drop the heat you save about 3 percent on your heating bill. So if you follow through every night and drop it to 55, that heating bill will be 13 percent less. Dust actually inhibits your heater and so it has to work harder during the day to keep the temperature to what you’ve set it at. If you get the vents and radiators cleaned out on a regular basis, that dust won’t be there to restrict airflow, thus your house will stay at the temperature it’s meant to be at and it’ll get to that temperature faster too. If you’ve got the advantage of a beautiful fireplace in your Vermont home, that’s great, but when it’s not in use, keep the flue shut. Leaving it open during the window is akin to leaving your bedroom window open in a blizzard. It’ll constantly be letting cooled off air into the house and your heater will need to strain to keep up. Straining might be good for you when you’re working out and just crushing those miles on the treadmill, but it’s not good for your heater or your heating bill, so take care. Your house can’t possibly air tight. No matter how great the weather proofing around your front door is, there’s a leak of hot air somewhere, the trick is actively finding these and fixing them. If you can manage to find just one, you could save anywhere between 10-20 percent on your heating bill. You won’t need to walk around your house feeling for drafts, but you should walk around the outside of your house and look around for where air might be escaping. Common culprits include doors and windows (obviously) as well as areas where the wires and cables enter into your home from outside and where pipes enter the house as well. Take some caulk and maybe even some weather stripping for some of the windows with gaps in them and try patching these gaps up as best as you can. Reach out to us to schedule your HVAC service today and keep your heater running efficiently and in the least expensive fashion as possible.